They say necessity is the mother of invention, and 9 times out of 10, I would say that is definitely how I roll in the kitchen. Mondays are when my parents come over to help out with the kids and spend some time with them, and most of the time, my mom brings over a new dinner recipe to try out. She’s retired and constantly scouring cookbooks, looking for new recipes, and new guinea pigs to try them out on. This week she decided to make a lasagna using some new oven bake noodles she found, and while I of course couldn’t have the gluten-goodness noodles, nor the tomato sauce, I wanted to make myself a dinner that would sorta fit into what the family was eating. 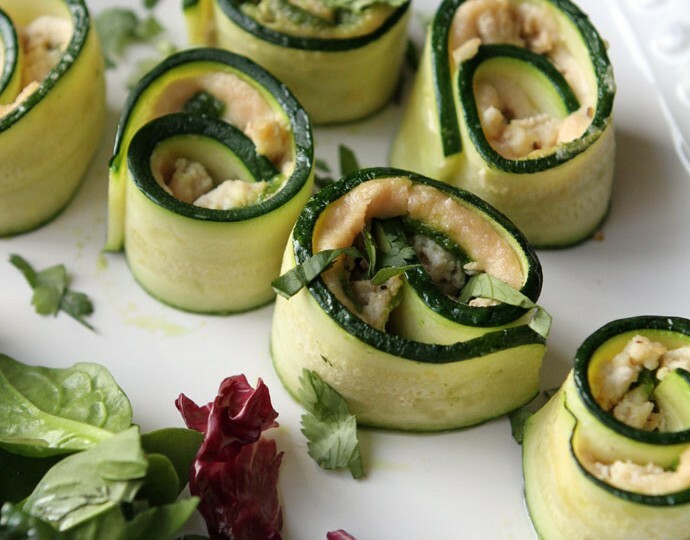 I immediately thought of a zucchini lasagna, but then I decided to get all fancy, hence these zucchini rolls were born. 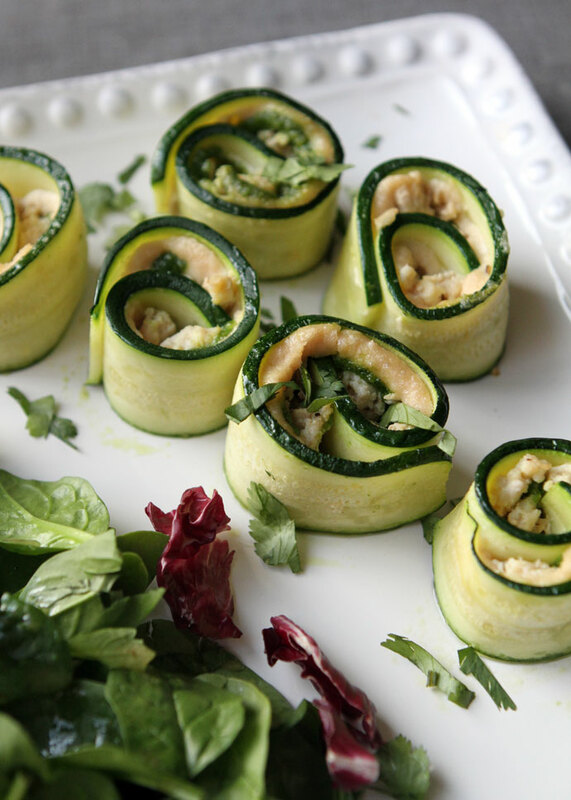 I’ve seen zucchini rolls floating all around Pinterest, so I know the concept is nothing new, but I had a hard time finding a recipe that would work for the cleanse; all either used ground beef, the vast majority used tomato sauce, which is a nightshade and a no-no on the cleanse. I already had the cashew cream made so I knew I could use that as a base to replace the usual ricotta/parmesan mix, but now I just needed something to give the rolls a bite, to replace the tomato sauce. Pesto popped into my head, and a meal was born. 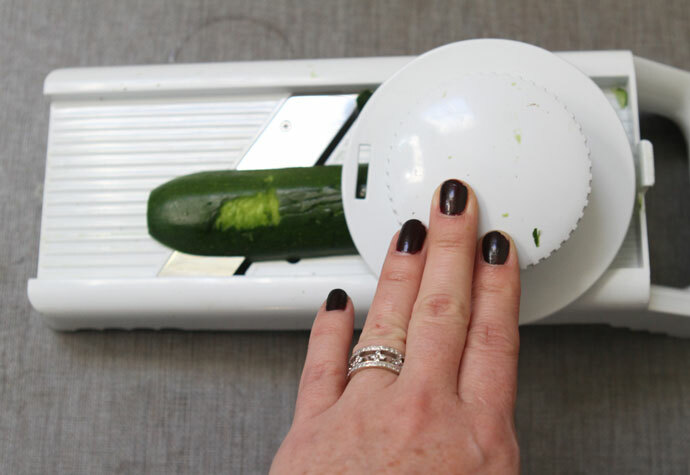 You’re going to want to start by slicing or putting your zucchini through a mandolin. Go for 1/4″ thick slices if you can. If using a mandolin like mine pictured here, I found a good trick was to start by passing the zucchini through the mandolin, very carefully guiding it with your hand. 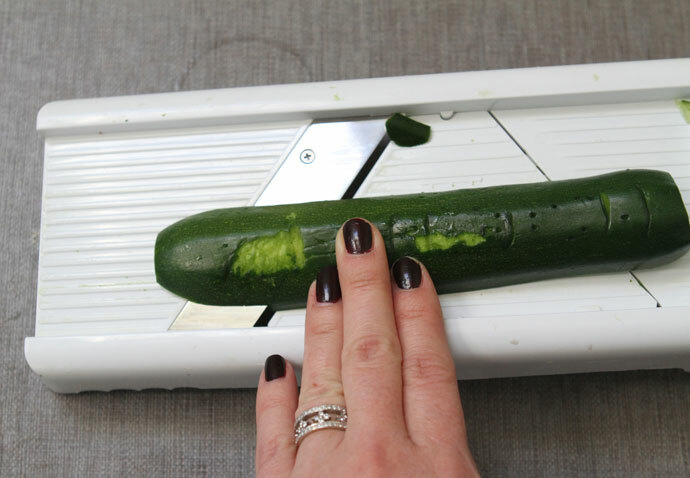 Once the zucchini had reached the part of the mandolin where it could sit in it, then add the cutting guard and continue to pass it through. 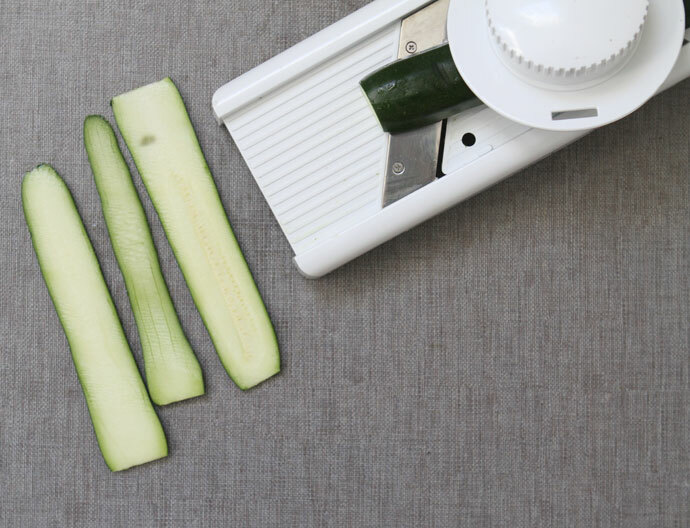 I learned to do this after clumsily trying to pass the extra long zucchinis through with the blade guard on, and quite a few of my slices snapped in half. 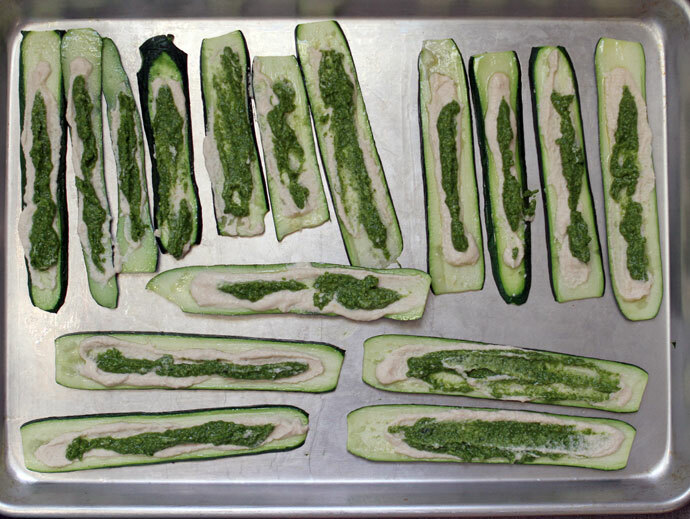 Once you have your slices all ready, lay them out on a baking sheet and lightly brush them with a coating of olive oil. This will give them some extra flavor and help them get a bit softer. Bake in a 375 degree oven for about 7-10 minutes, just till they’re pliable enough to work with. 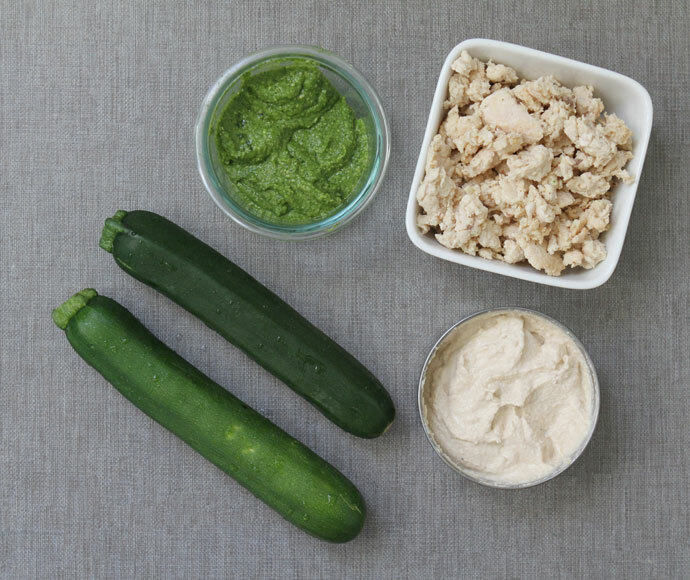 Now you’re just going to start smearing on your ingredients beginning with your cashew cream, then pesto, and then your pre-cooked ground chicken or turkey. If you have trouble finding a pesto sauce that doesn’t have dairy in it, you can seriously whip up your own in minutes. 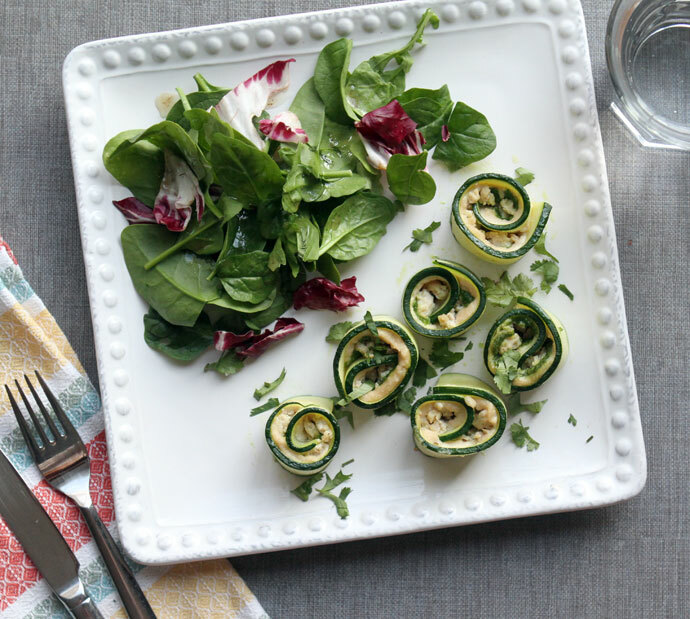 Think outside the conventional pesto box of basil + pine nuts, and go for any other type of soft leafy green and a mild tasting nut. For this batch, I used a salad mix I had on hand which was arugula + baby spinach, and cashews, and it may just be the best pesto I’ve ever made. 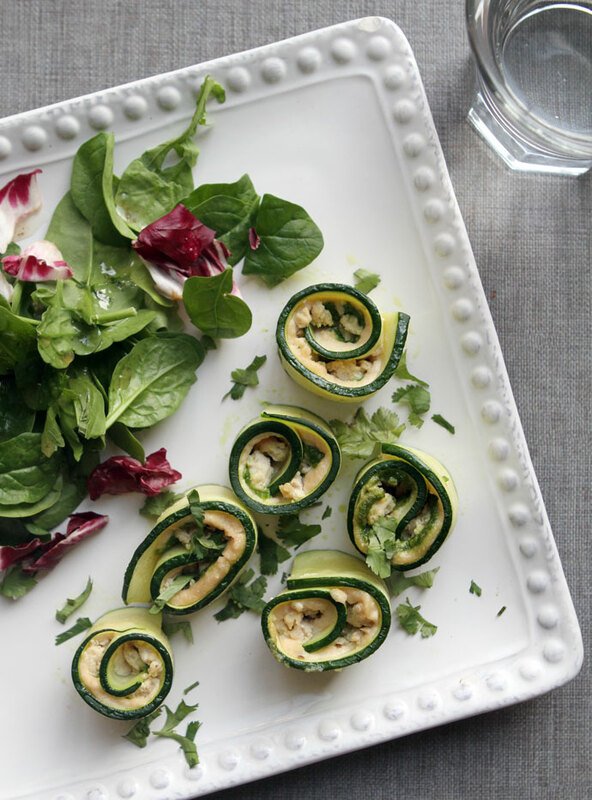 Your ratios are simple, 2 cups of greens + 1/2 cup olive oil + large handful of nuts, about 1/2 cup + salt to taste. Blend up in a blender or food processor and done! Add in more oil if need be, but these ratios are usually pretty full-proof. You don’t want to overstuff these or they will be more difficult to roll up, so be stingy, and just plan to have about 5-6 rolls to satisfy you. You can roll them up and then place them in a small baking dish, but I found that just tucking them in together nice and tight, on the baking sheet I was already using, worked just fine and meant one less dish to wash. Once all rolled up, bake in the 375 oven for 10 minutes, then broil for another 1-2 minutes to set them up nice and firm. You’ll find that once they are baked, they stay together fairly well, and aren’t so delicate. I cut mine in two, but my husband popped each one in his mouth whole, like a sushi roll. Now at this point, I’d like to offer two other suggestions for assembling these. If you want to cut your time in half, then you could simply layer these ingredients flat in a baking pan, like a traditional lasagna. Like I said, that was my original plan, I just decided to do something different since I had my mom there and she was helping manage the kids. But if you’re crunched for time, go for this method. 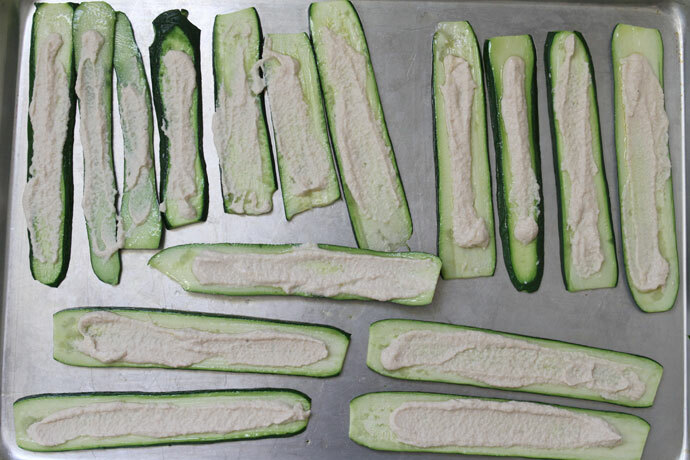 Another idea I had, which would work great if you don’t have a mandolin, is to slice your zucchini in thin rounds, and layer them flat like a lasagna, or layer them in cupcake baking tins, and have individual little lasagnas. If you have ramekins, you could do the round coins in those as well, then no fussing with trying to pop them out of the baking cup. Just some ideas. These are hard to mess up, so feel free to experiment. 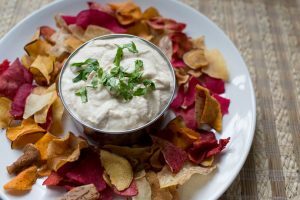 You can get the recipe for the cashew cream in this post, but stay tuned, as I’m going to be posting this recipe separately for ease of use, in the next few days. I’ll update the link once I do. The printable recipe for everything else can be found below though. Enjoy, and please let me know if you give these a try. 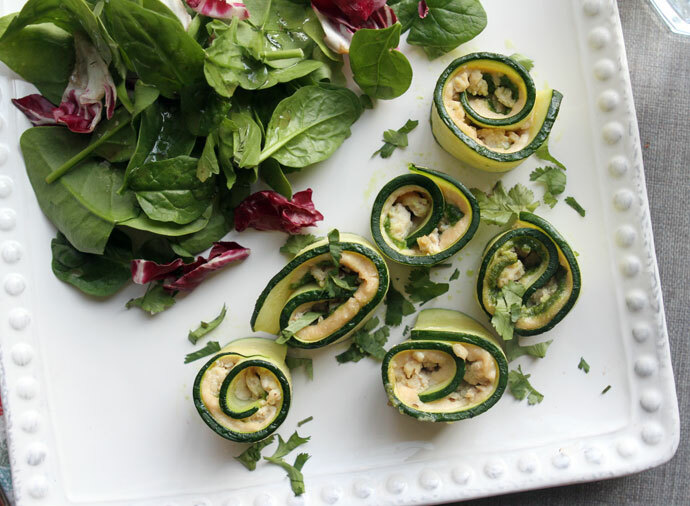 My kids aren’t keen on zucchini, but my husband and I love these, and are worth the effort to make them for a special treat for us. In case you’re wondering, the second night I made these (yes, I ate this 2 nights in a row), I went ahead and served the kids the ground chicken separately, and served broccoli because none of them like zucchini, and rice on the side. So it was a separate meal, but fairly manageable to throw together for them. I don’t do this often, but sometimes there’s no please everyone and I won’t be deterred from trying new things or enjoying the things I love, just to please everyone. Does that make sense? 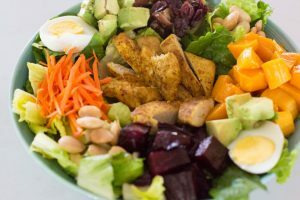 This healthy and tasty dish is great for a special weeknight meal and is gluten, dairy and grain free, making it both Whole 30 and Paleo friendly. Begin by cooking your ground turkey or chicken, by simply sauteing on the stove top, and set aside. 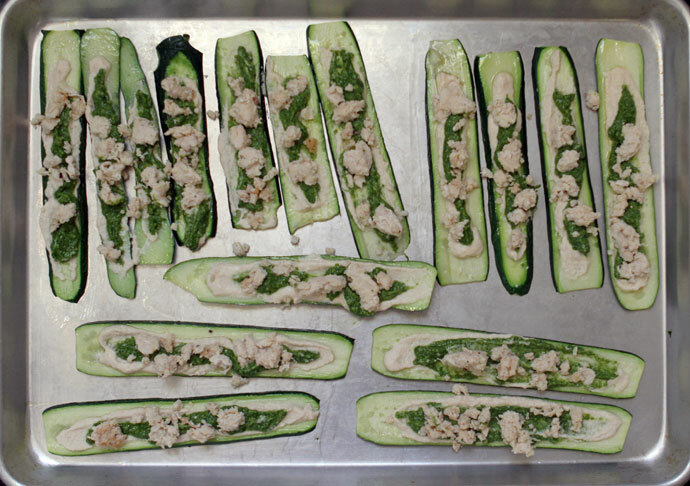 Slice or mandolin your zucchinis, placing them on a baking sheet. 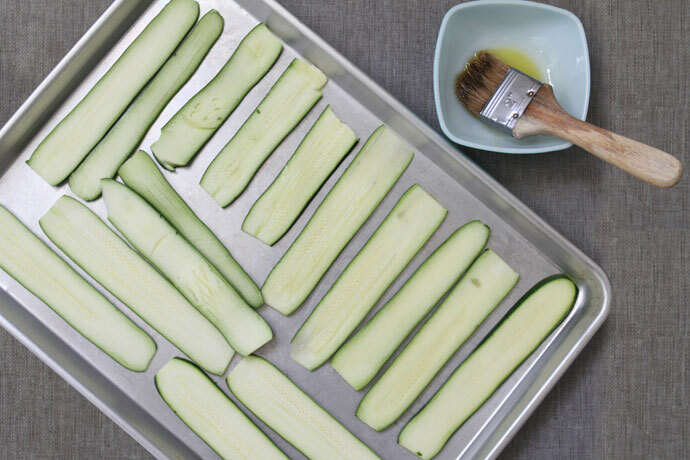 Brush zucchinis with a light coat of olive oil, then place in the oven and bake for 7-10 minutes. 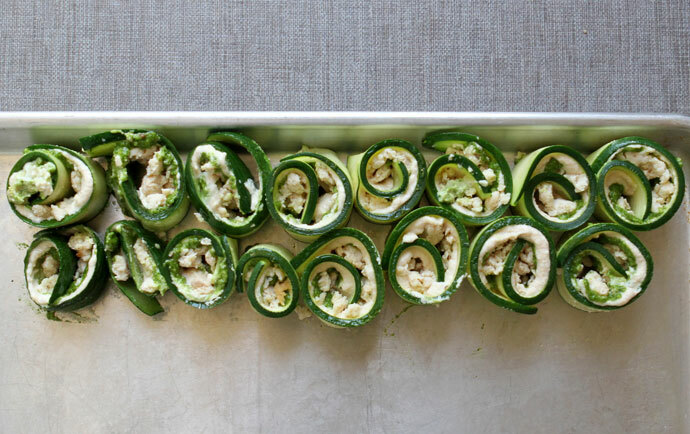 Add your filling ingredients to the zucchini slices, starting with the cashew cream, then the pesto, then sprinkle the chicken or turkey on top. 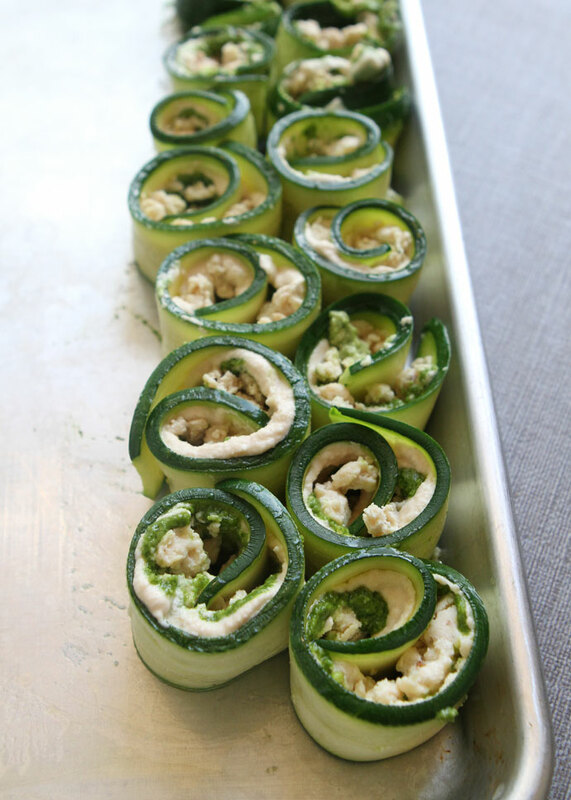 Gently roll up each zucchini and place topping side up, nestling each roll into each other, to help them stay together. Bake at 375 for 10 minutes, then broil for 1/2 minutes to help them set. yay! i was salivating when you posted these on instagram and was so hoping you’d do a post with the recipe. so excited to try these. yum!